Mark Rademaker, working with Dr. White of NASA Eagleworks has created a vision of a EMDrive powered solar system explorer ship. 2) 2MWe nuclear generator in the aft section of the ship. That is a max electricity availability of 2MWh of electricity every hour or 2,000kWh per hour. 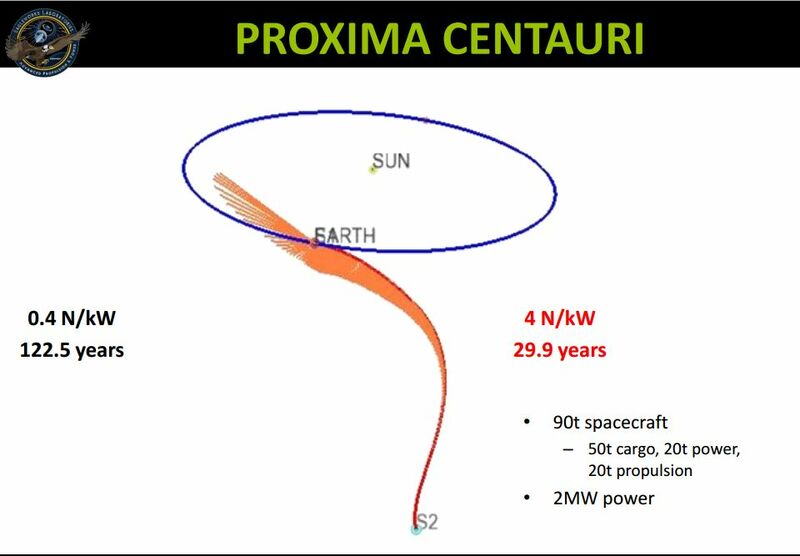 3) 20 EMDrive propellantless force generators rated at 4N of force generation per kW of applied microwave power. (4N/kW) Each of the 20 EMDrives (100kW energy usage each) will probably be driven by its own dual redundant 2 x 100kW microwave Rf generators. 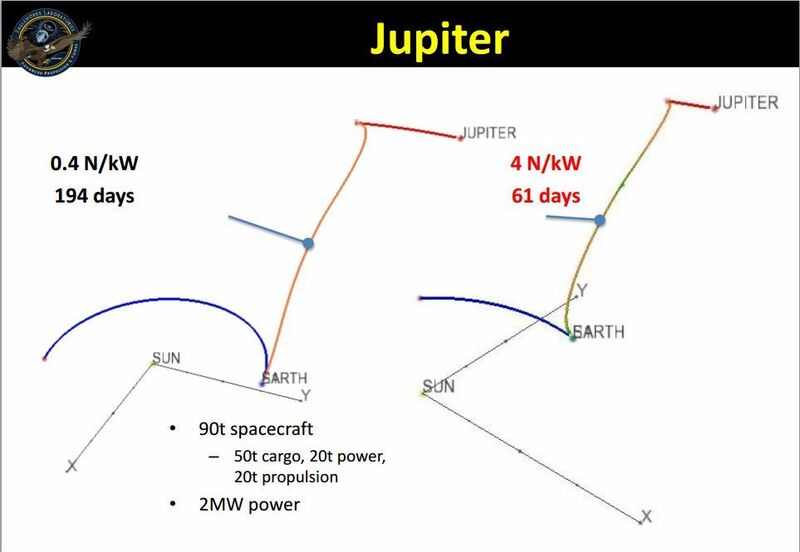 4) Total force generation of 8,000N being 2,000 kW of power at 4N per kW. 2,000kW * 4N/kW = 8,000 Newtons of force to drive the 90t ship. 8,000N is approx 816kg of force. 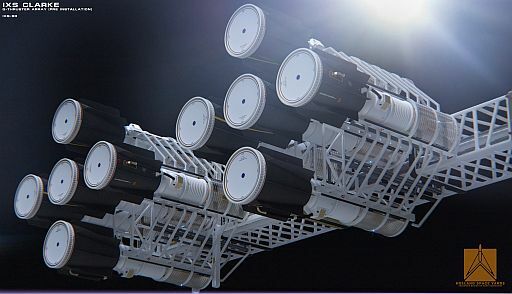 6) The IXS Clark's 90t breaks down as follows: 50t cargo, 20t EMDrives and support systems (microwave generators, cooling, etc), 20t nuclear generator. deltaMass and Todd "WarpTech" have shown in NSF EM Drive Thread 2 that Dr. White's derivation contains an error in the integration. frobnicat has discussed in NSF EM Drive Threads 1 and 2 other flaws in this analysis. 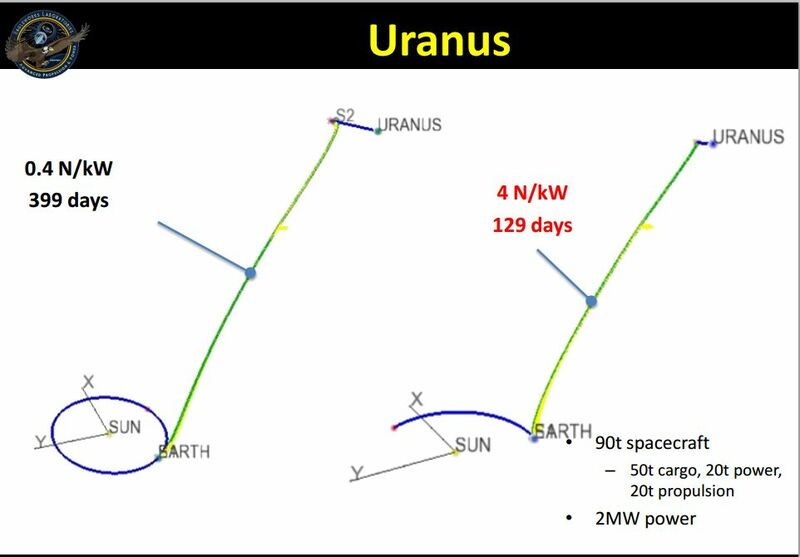 For the ion rocket consideration, the kinetic energy of the propellant needs to be properly taken into account. Please use the right hand 4N/kW transit examples. A lot more effort and reputation of advanced concepts research could be wasted on illusory claims. There is ongoing outright intellectual dishonesty with the proponents insisting on selling an effect enabling extravagant deep space deltaVs at clearly overunity discount energetic costs and insisting on non overunity of the effect. 180 times more kinetic energy out than energy that was put in. 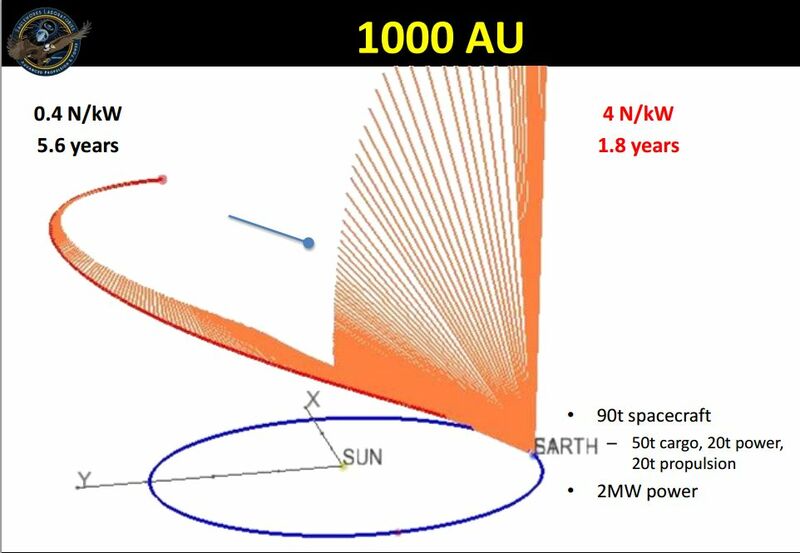 This is not something we could do even if solar system were paved from Sun to Pluto and we had tyres to pull on that ground at 100% efficiency. So this extravagant claim of Pluto at 12.4 month is not dependant on cheap momentum, it is entirely, utterly, irremediably dependant on cheap energy. 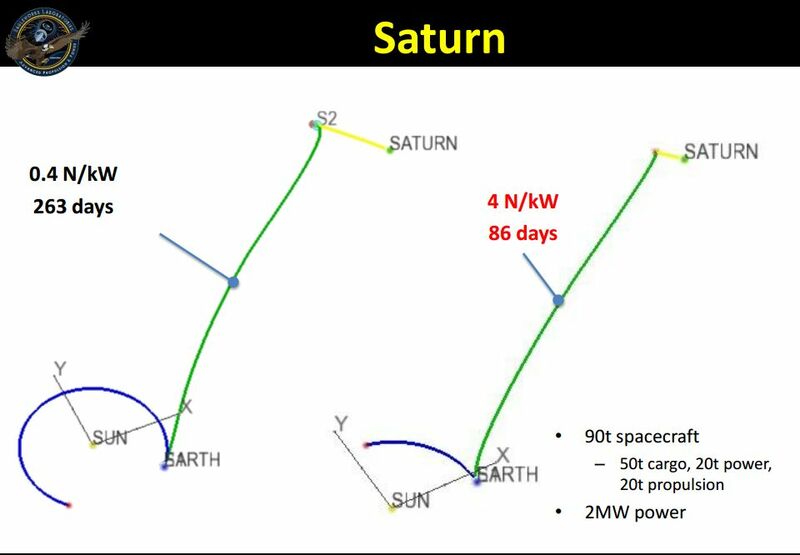 This is something we could do if solar system were crossed by a conveyor belt that happen to move from sun outward to Pluto at above 360km/s and our ship could drag on that flow. Solar wind fits the bill, but it is not of high enough density (and clearly can't explain results down in earth labs). 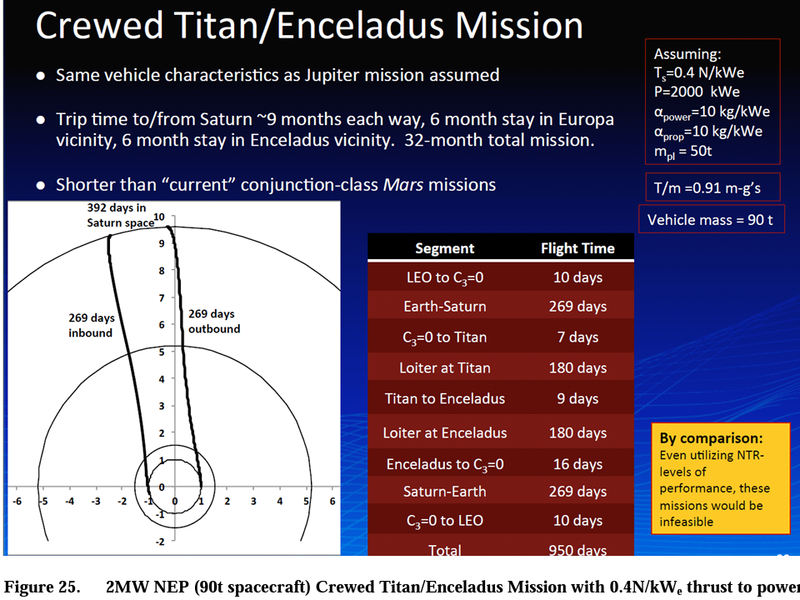 If EM drive is possible and enables such deep space transit times, then the problem is not that it respects CoE or not, the problem is how it could respect CoE when we see the required energy leverage ratio : this makes it closer to sailing than driving. 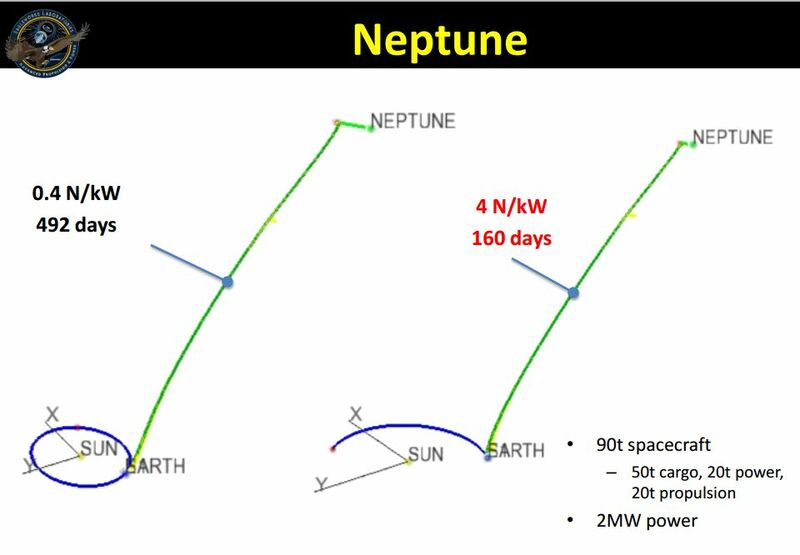 And no proponent claiming both those transit times (implicitly overunity energy) and respect of CoE have ever cared to publish the slightest remark or experimental sidereal time check about a possible preferred frame to sail on (heliocentric ? galactocentric ? CMBcentric ?). They clearly don't believe in such possibility despite being the only way to reconcile both short transit times and serious CoE (short of plain ZPF energy extraction). The image I posted was from the 188 run of the SPR Demonstrator rotary test. Same test run as the video. What I read from that rotary test experimental data is there is no overunity as magnetron Power is dropping as Velocity is increasing. Shawyer has explained this happens because acceleration shifts the cavity resonant frequency, Q drops from some of the EM wave cavity energy being converted into kinetic, increasing cavity losses, Force generated drops, stopping overunity operation. Shawyer has been saying this for years and in the graphic we can see it actually happening. So why in hell are you never ever applying those purported OU limiting effect with mission profiles ? 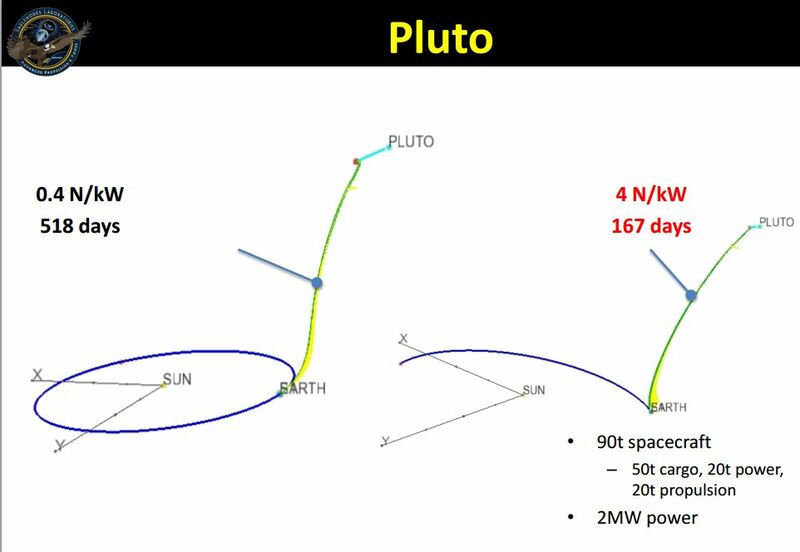 How can you decently say "1N/kW => Pluto in a year" in a post and "there is no overunity as magnetron Power is dropping as Velocity is increasing" the following post ? Please apply those purported OU protecting effect in the sold mission profiles. Otherwise it's like saying that your Unicorn can find shortcuts through fairyland in one post, and saying that of course fairies don't exist the next one. Hope you understand why this feels dishonest, and why a number of contributors will always strongly object as long as such canards are sold as perfectly all right. 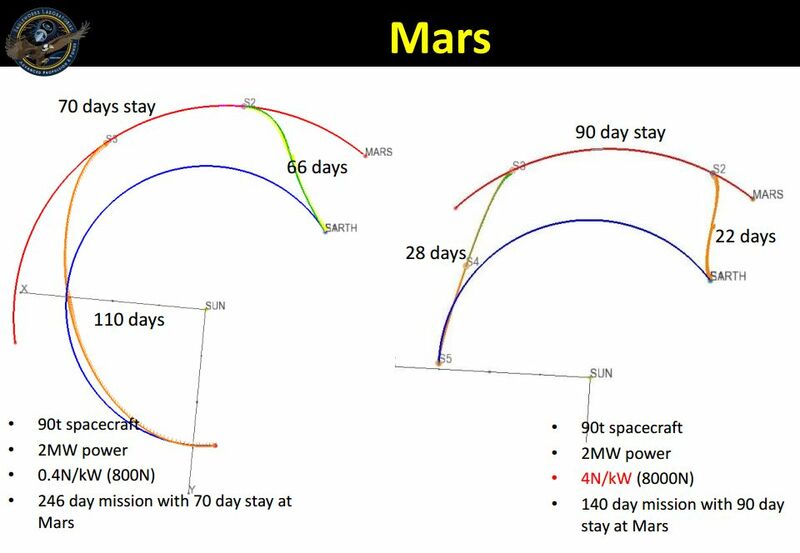 The transit time examples above are not mine. They were calculated by Dr. White, the head of NASA Eagleworks. If you have an issue with them I suggest you take it up with Dr. White. I now believe, having worked through solenoid magnetic coil examples, some of the initial, before acceleration, cavity energy is used to supply the initial energy used to start the acceleration. As that energy drain lowers the cavity Q, it also alters the cavity impedance and affects the power drawn at the start. What I suspect is that sometime later a equilibrium condition will be reached, when there is no more excess, to the lower Q cavity, energy to be used to support acceleration. Then the power consumed will increase and reach a steady state, matching cavity surface losses and cavity kinetic conversion losses versus cavity input energy and Rf generator consumed energy. Then I expect to see steady state acceleration following A = F/M and constant power supply energy consumption. So don't panic just yet. We only have data for the 1st few pages of a much longer 1st chapter. This page was last edited on 26 July 2015, at 19:24.